Another week of high school is in the books all across the state of Utah, and some new names made headlines along with some we recognized last week. Region battles are right around the corner, but from this past Friday night, here are some notable performances we heard about. Let us know about the big plays and players we did not get on our list…. For the second straight week, a late missed point-after-touchdown by its opponent allowed Brighton to survive for an exciting victory. This week’s 28-27 win over American Fork featured 14 carries for 127 yards and two TDs from Sione Lund and a pair of long scoring runs from Simi Fehoko, who caught a 62-yard touchdown pass and returned a punt 83 yards to the house. Fremont continued to look good this season with a 55-28 win over Riverton Friday. The Silver Wolves rode a great night from quarterback Saxton Morby, who completed 13-of-16 for 239 yards and three scores and ran for 53 yards and another touchdown. Haze Hadley was on the receiving end of six of those aerials, accounting for 122 yards and a score. 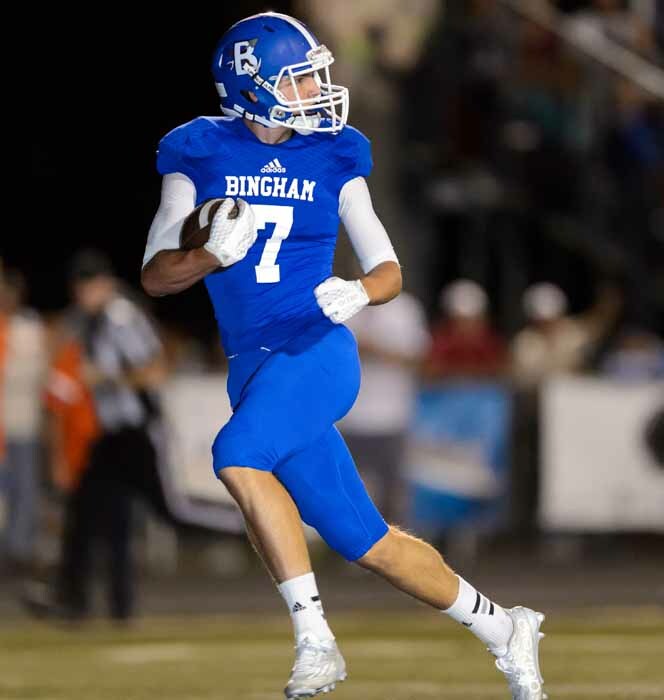 Bingham did not get the win when the top-ranked team in the nation came calling Friday night, but there were some exciting moments during the 38-20 loss to Bishop Gorman. Most notably was the connection between back-up quarterback Matt Degn and sophomore receiver Brayden Cosper, who hooked up three times in the second half for touchdowns of 18, 20 and 25 yards. The outstanding start continues for Canyon View with a 42-41 win over Cedar. Jackson Vasi led the way with 34 carries for 170 yards and three TDs. He also added another score as a pass catcher. 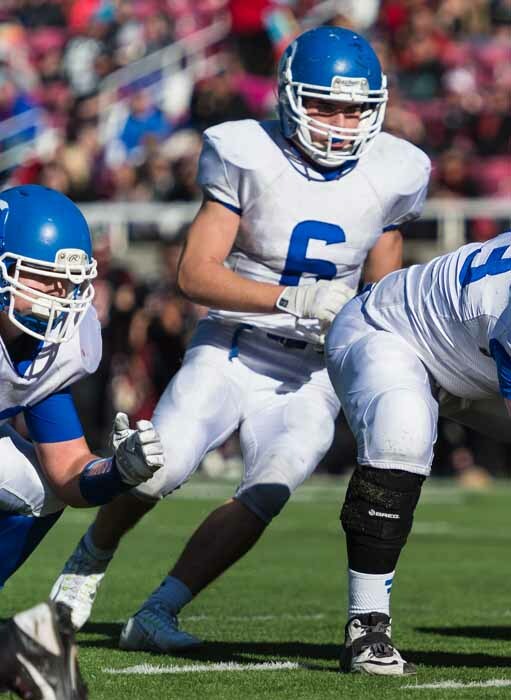 Garrison Beach continues his outstanding season spinning the ball for Sky View. He was 24-of-31 for 326 yards and two touchdowns as the Bobcats claimed a 35-11 win over Highland. Jordan built a 21-0 lead over Pleasant Grove only to see the Vikings even the score in the second half. The Beetdiggers used a late touchdown run by Alec Evans to claim the 28-21 win, which was fueled by eight receptions for 161 yards from Spencer Curtis. Wasatch earned a 30-27 win over Orem on Skyler Southam’s third field goal of the night, a game-winning 33 yarder. Southam had a good night on defense for the Wasps as well, with a pair of interceptions. Sione Finau (18 carries, 159 yards, 80-yard TD run along with a receiving touchdown) and Shay Reid (nine tackles and a 62-yard pick-six) led Kearns to another win, 28-12 over Cottonwood. Springville receiver Bennett Hullinger had a big night in the Red Devils’ 27-0 win over Mountain View. Hullinger caught five passes for 113 yards and two TDs. Isaac Tillett had a big night in South Summit’s 27-24 victory over Park City. He carried 24 times for 178 yards and two scores, and also had two catches for 80 yards and a receiving touchdown. Sophomore quarterback Cammon Cooper was extremely efficient in the passing game as Lehi claimed a 34-28 win over Granger. Cooper was 20-of-23 for 304 yards and five touchdowns for the Pioneers, completing passes to seven different receivers. Wyatt Parkinson caught three TDs and Cody Frampton hauled in the other two. Big plays in the passing game featuring receivers Jairen Clayton (six catches, 143 yards) and Julian Blackmon (80-yard TD reception) helped Layton and its star passer, Tayler Katoa, to a 47-27 win over Northridge. Katoa (14-21-276-1 in the passing game and 13-116-3 as a runner) had another big night for the unbeaten Lancers. In the Northridge loss, Jrue Perkins put up big numbers once again. He completed 15-of-25 for 288 yards and three scores, while running for 97 yards. The defending Class 3AA champs opened up the passing game behind a pair of triple-digit receivers Friday night. Bret Barben caught four passes for 139 yards and two scores, while Jade Harrison pulled in five balls for 123 yards in Dixie’s 45-13 win over Alta. West Jordan’s Tanner Peterson caught touchdown passes of 35 and 53 yards in a 28-point second quarter as the Jaguars beat Skyline 42-16. The dual-threat quarterback is all the rage these days, but how about a triple threat? Beaver’s Matthew Roberts carried the ball 13 times for 156 yards and a touchdown in a 38-14 win over Millard. He also completes 8-of-14 passes for 148 yards and a pair of scores, but for good measure, Roberts had 11 tackles. Timpview got its running game going again Friday, and also have some big plays in the passing game in its 32-22 win over Taylorsville. Saia Folaumahina carried 16 times for 155 yards and two scores for the T-Birds, while Sampson Nacua had a 87-yard TD catch and two receptions for 126 yards overall. Provo moved to 3-0 on the season with a 34-20 win over Judge Memorial. Provo’s Bulldogs scored all 34 points in the second period, keyed by two fumble recoveries for touchdowns (Daniel Kelly and Michael Maio). 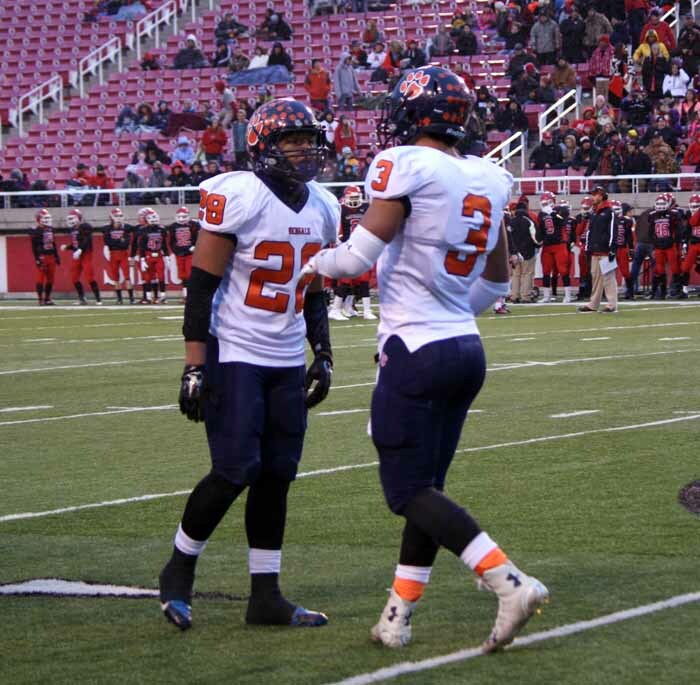 There were a lot of big performances in the Summit Academy 63-6 win over South Sevier. Tyson Dais ran for a 28-yard touchdown and housed a pair of interception returns, while Darrin Gethers was the big-play guy with a 90-yard kick return TD and an 88-yard touchdown reception. Cameron Mortensen (16-of-24, 279 yards, five touchdowns and 13 carries for 54 yards) and Brevin Dean (six receptions, 161 yards, TD) were the offensive stars for Weber in a 37-29 win over Bonneville. Balance on both sides of the ball has been key for Davis in its 3-0 start, which continued with a 44-7 win over Olympus. Connor Taylor led the Dart defense with 18 tackles. Two-way performer Austin Allred ran for 87 yards and a pair of touchdowns, and also recorded 11 tackles in Emery’s 35-14 win over Delta. Not many passes hit the ground for Mountain Crest during its 49-0 win over Logan. Tanner Schwab was 23-of-26 for 225 yards and four TDs. Kobe Tapalian was a workhorse for Pine View in its 30-15 win over Manti, with 36 carries for 159 yards and two touchdowns. All-around athlete Chaz Ah You was all over the field once again for Westlake as the Thunder knocked off Hillcrest 31-6. Ah You carried six times for 69 yards, caught three balls for 41 yards, had 10 tackles and intercepted a pass. Quarterback Dalton McElheney rushed 18 times for 191 yards and two touchdowns to lead Grand to a 28-14 win over American Leadership Academy. It was a big night for Maple Mountain receiver James Wilson, who caught six passes for 152 yards and a pair of touchdowns as the Golden Eagles beat North Sanpete 41-15. 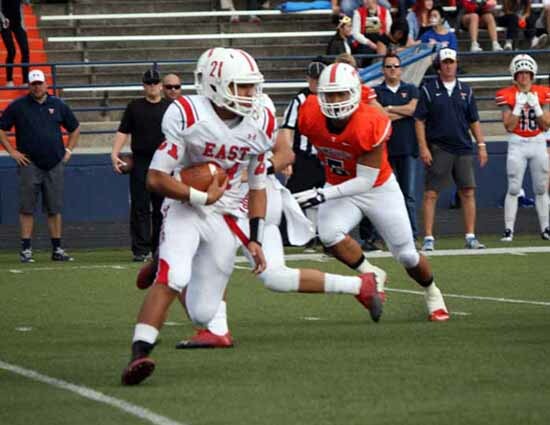 Helaman Suesue helped East to a 45-7 win over Clearfield with scoring runs of 87 and 20 yards. Quarterback Jordan Hardy ran 16 times for 202 yards and three touchdowns, and also passed for 126 yards as Milford knocked of North Sevier 46-0.